Once you've experienced what it's really like to use washable nappies on your little one, we think you'll be as excited as we are about them and their benefit to the environment! Nappies – it’s not just a choice of big brand versus supermarket disposables, there’s actually a whole range of washable nappies out there too. Like all products for babies you have decisions to make, choices that until you’ve experienced using something first hand it’s often hard to decide what’s the best way to spend your money. Unlike choosing a travel system you don’t need to have your washable nappies ready for the day your baby is born, it’s a choice that can wait until you’ve had a while to just watch them sleep, eat and sleep some more (hopefully!). You can borrow our pack at any time from day 1 onwards, when you feel ready. There are a mix of brands in our packs. Not every brand is represented, nor are many of the patterns/colours of nappy available. We looked at the nappies in other trial packs, asked the experts selling them and finally tried out a range on our babies too. How do you borrow a kit? Live in one of the London Boroughs of Brent, Ealing, Harrow, Hillingdon, Hounslow and Richmond upon Thames. If you’re not sure check your council tax bill. Have a child that’s in nappies. Can show us paperwork that proves you are a parent and live in one of the 6 boroughs listed above. To lend you the pack we’ll come to meet you somewhere close to home, perhaps a baby group you go to or a local café. The questionnaire asks for some basic information and will help us make sure the content of the pack is right for you as some of the nappies come in different sizes. You can borrow the pack for 3 weeks. We’ll be at the other end of the phone or email if you need a helping hand and then we’ll come and collect it from you. Just complete a quick questionnaire and we’ll get in touch with you to arrange to get a pack to you at somewhere convenient for you. Why are West London Waste so excited about these nappy packs? If you already have a baby at home you’ll have seen just how many disposable nappies you throw away. With anywhere between 4 and 10 nappy changes a day that’s quite a lot of space in your black bag or bin taken up by nappies, wet wipes and cotton wool each week or fortnight. Putting so many materials in to nappies just to burn them or have them buried in the ground for up to 500 years before they break down doesn’t seem like a good use of all the effort to make them or your hard earned cash to buy them. 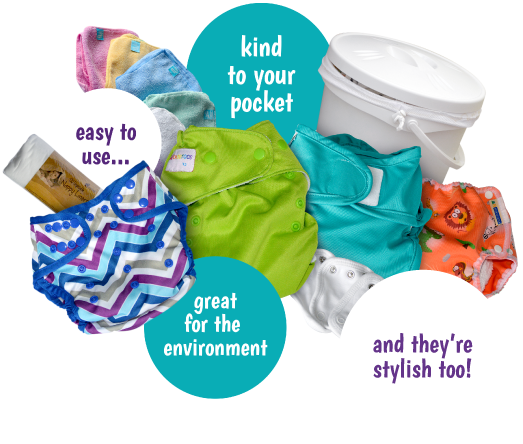 Being concerned about the impact you and your baby have on the environment could be one reason for choosing to give washables a try. The financial cost may also be a big factor. There’s the cost saving for you, which could be £500 for the first child in washable nappies then more than that for any other children. Washable nappies also keep their value well if looked after, you could get most of your money back if you sell them on when you don’t need them anymore. There were just over 15,500 babies born in west London hospitals in 2014/15.  The nappies for each one weigh around 1kg a day so each year that’s almost 5700 tonnes of waste sent for disposal, with a huge price tag of just under £700,000 each year until nappies aren’t needed anymore. Not only will you as a parent spend a lot of money over the years buying those disposables, you’ll be paying again, through your council tax, to dispose of them too.